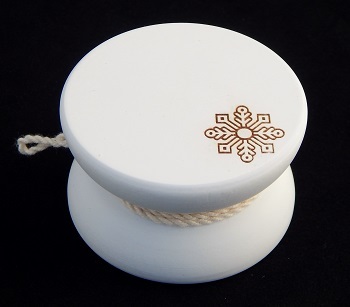 A YoYoFactory Legend Wing Snowflake is a fixed axle wooden yo-yo in a slimline butterfly profile. The white paint had a rubberized texture to it. A single laser engraved snowflake design was added to one halve; opposite side is blank. This model, along with the YoYoFactory Loop 720, Hubstack Afterglow, Shutter Wide Angle, Flight, and Replay PRO were part of the YoYoFactory Snowflake collection that was released in December 2017. Original retail price: $12 US.